FRISCO, Texas (AP) — Dak Prescott took plenty of time away from the cameras trying to explain why he thinks the Dallas offense is close to breaking through the struggles most responsible for the Cowboys‘ losing record. 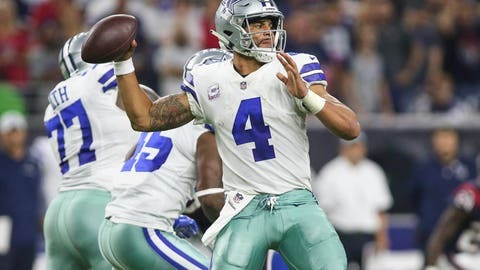 The quarterback at one point looked for help in his description from Cole Beasley, the receiver who sounded off recently about the frustration his group feels in a sound bite that was perceived as a shot at Prescott. In short, Prescott sees no issues of unity with the Cowboys (2-3) trying for the third time to get back to .500 with a home game coming off a rough road trip. Jacksonville (3-2) visits Sunday. Newcomer Allen Hurns has joined Beasley in trying to defend a receiving corps struggling to replace Jason Witten and Dez Bryant and getting the criticism that figured to go with it. The former Jaguars player also caused a stir by suggesting that a particularly poor play call resulted in Prescott’s second interception against Houston in a 19-16 overtime loss. Hurns didn’t back down, but coach Jason Garrett and Prescott didn’t necessarily agree that the call was so terrible. Offensive coordinator Scott Linehan brushed it off as a non-issue. The Cowboys have the 30th-ranked passing offense in the NFL and the second-fewest touchdowns. The receivers haven’t really earned the right to second-guess because they aren’t producing. But everyone agrees it’s a combination of protection, Prescott’s accuracy and their shortcomings. The Cowboys have the NFL rushing leader in Ezekiel Elliott, but Prescott is still close to the bottom of the league in key passing efficiency categories two years after setting a rookie passer rating record as NFL Offensive Rookie of the Year. To illustrate how he thinks the team is close, Prescott points to a play late in regulation against Houston when tight end Blake Jarwin was open for a big gain but J.J. Watt got to the quarterback before he could make the throw. Had the Cowboys converted that play, they likely would have been in position to kick a winning field goal. As the Cowboys keep working to get there, Garrett has no concerns about a divided locker room. Elliott used a few expletives to try to illustrate how he believes his teammates are accountable. “There’s enough accountability in this locker room that there’s not going to be any finger-pointing,” the star running back said. NOTES: DE David Irving returned to practice after a longer-than-expected excused absence to deal with an ongoing custody issue involving his young daughter. Irving was eligible last week after starting the season on a four-game suspension for violating the league’s substance-abuse policy. He practiced one day but left the team again to deal with the personal issue. The Cowboys decided to keep him out of the game against the Texans. … Dallas signed CB C.J. Goodwin from Cincinnati’s practice squad and S Darian Thompson from Arizona’s practice squad. Dallas added RB Darius Jackson to its practice squad, replacing former Alabama RB Bo Scarbrough. … LB Sean Lee (hamstring) went through individual drills but was listed as a non-participant in practice. He is expected to miss his third straight game.